Shutting down for tonight. Just wish the camera would pick the sparkle that's really going on here, maybe when you click for a closer look it will show up. Our Creative Corner OCC Challenge-Bows!!! 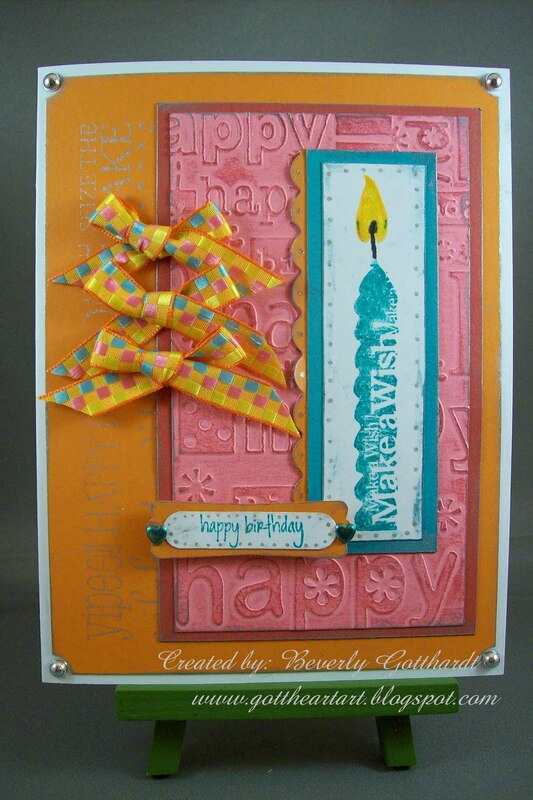 Supplies: White Card Blank 5 1/2" X 6" Halcraft, Papers: Stampin Up, Stamps: Inkadinkado-99538 Birthday Sentiments, Studio G-VS4911 Series 17, Hero Arts-S5027Design Block Birthday, Ink: Stampin Up-Bermuda Bay, Brilliance-Starlite Silver, Craf-T Metallic Rub-Ons, Sakura Gelly Roll pen-Clear, Spica Glitter pens, Cuttlebug embossing folder-Happy Birthday, Fiskars-Scallop Sentiment border punch, Stampin Up-ticket punch, Stampin Up-Modern Label and Word Window punches, Michael Richard's-Metallic dots, small heart brads, pop dots. Well, isn't this just adorable, love all the little extras. Great colors too. Thanks so much for playing along with my sketch challenge this week! Great job. This is so cute! Love the main image and all the texture! 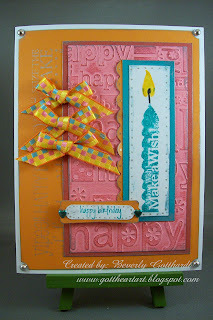 Cute, Beverly--that candle image is very cool!